Peter McCormack: Hi there, Bill. How are you doing? Bill Barhydt: I’m doing great. How are you? Peter McCormack: I’m pretty good, thank you. So you’ve had quite a big week. Bill Barhydt: Indeed. It’s been awesome. Peter McCormack: So a nonstop stream of congratulations and thanks and people praising your latest announcement on Twitter. And I also watched your interview with Ryan Selkis, which was very, very good. So firstly, I kind of owe you an apology, but you won’t realise why. I think I … I think I kind of dismissed ABRA unnecessarily. When I was first introduced to it, I took a quick look and thought, “Oh, this is just another exchange” and then completely ignored it and completely ignored everything you’ve done. But you aren’t just a normal exchange, are you? Bill Barhydt: No, we are not. We are probably one of the coolest applications leveraging Bitcoin on the planet, certainly that I’ve seen, and I’m pretty well-informed about our space. ABRA uses Bitcoin tech to basically build the foundations for what really will be a global bank, whether it’s for investing, later credits, or payments and money transfer. It’s a very unique model. And the good news is consumers are using it. We have hundreds of thousands of users, and it’s growing. And you mentioned the response to our latest announcement, which is the ability to use our platform to invest globally in US stocks as well as cryptocurrencies and fiat currencies. Peter McCormack: I think that’s a very interesting point actually because I think there’s a lot of comparisons between crypto and the first dot com era and where everything was E-commerce and lots of over-invested businesses failed. And then the real kind of surprise was that the biggest businesses came from things which we didn’t expect, like social media and search, kind of new businesses. And I think what’s happened with crypto, it’s all been based on speculation or the expectation that people will use it as a payment channel. But that’s really kind of a red herring really, isn’t it? Because what crypto allows you to do is build new models for financial infrastructure, right? And that’s what you guys are doing. Bill Barhydt: That’s right. Ultimately, the way I see Bitcoin and crypto in general, but specifically Bitcoin, is as a hard money digital reserve currency. And I’ll explain what I mean by that. But also that’s programmable, and the programmability of Bitcoin enables what ABRA is doing. Now, the internet itself is “programmable” via TCPIP, but the average user doesn’t have to understand or probably doesn’t even know what I just said or understand what I just said. And I think the same holds with Bitcoin. The average user using Bitcoin 10 years from now will probably either not know they’re using it, not even know it exists, or have any technical understanding of what’s going on with the banking services they’re using that are enabled by it. Peter McCormack: Okay. So you think people will still be using fiat, but it will be, what, collateralised by Bitcoin? Bill Barhydt: I think many applications globally will benefit tremendously by taking fiat currency and using it via collateralised Bitcoin because it doesn’t require banks in the middle of the transaction flow, which has a lot of benefits because it eliminates legal friction, it eliminates unnecessary costs, it can increase settlement times. It could simply increase access, like with our new stock product, right? We have people now in Mexico, Middle East, India, China, Southeast Asia who will be able to access investing in US stocks for the first time because of the way we’re offering collateralised, effectively bets, on the stock. You simply make a bet using the value of Bitcoin that the price of the Apple shares will go up. If you’re in the money on the bet, the payout is in Bitcoin. And if you’re not in the money on the bet, the payout is still in Bitcoin, meaning the payout to the counterparty on the bet. And so it’s very similar to the idea of what happens when you buy and sell a stock, but it eliminates that friction because, for the person who just wants investment exposure, including getting their dividend payments, owning the physical shares is most often not necessary. And so it really is right-sized for a global audience in a way that has never been possible before, in our opinion. Peter McCormack: I guess the only difficulty on that side is that, if it is … if you are buying and selling in Bitcoin, you could make the right bet in terms of, say, the Apple stock but still lose in dollar terms if the price of Bitcoin is falling. Bill Barhydt: No. In this case, that’s not true because you’re actually hedging against both the dollar and Apple shares. So it accounts for the underlying change in the price of Bitcoin versus the dollar as well as Apple in the case … or in the example that I mentioned before. And so the system is smart enough to adjust for that. And so you wouldn’t be taking dollar Bitcoin risk in that transaction, specifically in terms of how ABRA works. Again, it’s all transparent to the user. They don’t have to understand all that complexity, but it does adjust for that. Peter McCormack: Does it adjust both ways? So for example, if the price of Bitcoin was to shoot up, would you have missed out on that opportunity? Bill Barhydt: Yeah. If you were no longer just holding raw Bitcoin, sure. So if you basically use your Bitcoin to collateralise the price of an Apple share, then you’re only getting the benefit of the movement or fall in the price of Apple, nothing else, hundred percent, and reconcile whatever currency Apple is reconciled in, which in this case would be US dollars. Peter McCormack: Okay. So before we talk about that, ’cause obviously that’s very interesting, I think we should go back a step and just do the backstory of ABRA because … And actually, I’ve got a question for you first. I don’t know if I told you this. I’ve actually visited your office, and one of the interesting things is that obviously you’re smack bang in Silicon Valley, yet your Bitcoin base, almost every other … I think actually you’re almost the only business I’ve heard of that is building this kind of infrastructure in Bitcoin. Everybody else is doing it in Ethereum. What’s the reason you’ve gone for Bitcoin and what complexities does that have? I’m assuming you reviewed Ethereum. Bill Barhydt: Sure. I would say two things. I would say most companies are building in SQL, like exchanges, so meaning they’re completely centralised. And if you’re trading crypto, you’re not actually getting crypto. You’re getting a number in a database and a promise that if you want crypto they’ll give it to you. And so ABRA is actually not using a database to store people’s … the value of people’s funds. They’re actually stored on the Bitcoin blockchain. The blockchain becomes the ledger, and the asset becomes Bitcoin. Now, the reason we did is effectively three-fold. First, we needed a digital asset. Let me take a step back, back to your earlier point about why we’re doing this, and I think that relates to why Bitcoin. We want a single app to become that WhatsApp for money globally. And what I mean by that is you have one app that works in over 150 countries, that allows me to make investments, get loans, send money, and basically do all the banking transactions that I would want to do as a consumer in pretty much any country in the world. And there’s a lot of reasons why, up until ABRA, that was impossible. Legal reasons, technical reasons, liquidity reasons, et cetera, et cetera. And I believe we have figured out how to solve those problems to create that single application. The cornerstone of that is this synthetic asset model that ABRA has created, and what that effectively does is it allows each consumer or each user of ABRA to turn their phone into its own bank, as opposed to ABRA becoming the bank. Okay? That’s what the synthetic asset does. Now, to create that synthetic asset, back to your original question, you effectively have to fulfil three requirements. The first is the asset, the digital asset, has to be highly liquid and have a very large market capitalisation. Because if you have a billion people using it, you have to be able to break it up into tiny pieces so that everybody can participate, right? If I’m investing in Apple shares and 100 million other people are investing in Apple shares, you have to have enough Bitcoin or whatever the digital currency is to collateralise those contracts. The second part is you have to be able to get your money out of the traditional system and into the ABRA wallet somehow in every country in the world, right? Whether it’s using the digital currency directly or via your bank account, right? And then the third is the digital money has to be programmable to create the smart contracts that we need to fix the value of the digital currency in other assets, which is how this synthetic currency works. You’re taking Bitcoin and you’re collateralising a contract using the Bitcoin to give you investment exposure to dollars, euros, pesos, Apple shares, other altcoins, whatever it is you’re holding, okay? And when we started ABRA, Bitcoin was the only technology and network in existence that met all three requirements. I would say that Ethereum now meets those requirements, but I would say then, in terms of hard money, Bitcoin is a safer bet. And also the complexity of developing in Ethereum is much, much higher in terms of what ABRA’s system is doing. And so in that regard, Bitcoin is a safer bet for us. Peter McCormack: We’re going to have to work through them. Okay. So the first thing that struck me then is that you create … you can have synthetic currencies, right? Bill Barhydt: Yeah. Everything in ABRA, unless you’re just holding Bitcoin, is a synthetic currency based on Bitcoin. Everything, no matter what asset you’re holding. Peter McCormack: So I interviewed Zac Prince from BlockFi. You probably know Zac. Peter McCormack: And one of the things we talked about is they provide loans, but they do it … you can have it in GUSD, the Gemini dollar stable coin. And the reason he explained that to me is he was talking about how much people borrowed dollars around the world. And in a country like Argentina, people want to borrow dollars because it’s a more stable currency, and they’re going to use it to counter the impact the fall of the value of their own currency. So are people using ABRA as a way … similar to what we’ve heard about in, say, Venezuela? Are they using it to deposit their own currency and kind hold dollar, almost using you like a stable coin? Bill Barhydt: Yeah. They are. They are. So we have a lot of people who, from China, from Venezuela, from Argentina, actually from countries all over the … India, all over the world, who are depositing Bitcoin into ABRA and then converting it to dollars, because somehow they were able to convert their home currency into Bitcoin, put it into ABRA, convert it into dollars, and then effectively get a free hedge versus the falling value of their home currency versus the dollar, which is effectively what you’re saying, right? And so we have a lot of people to do that. And we love that. That’s a great use case for ABRA, and it’s a great onramp as well at the same time. Peter McCormack: And how much of a threat are you to the traditional banking system? 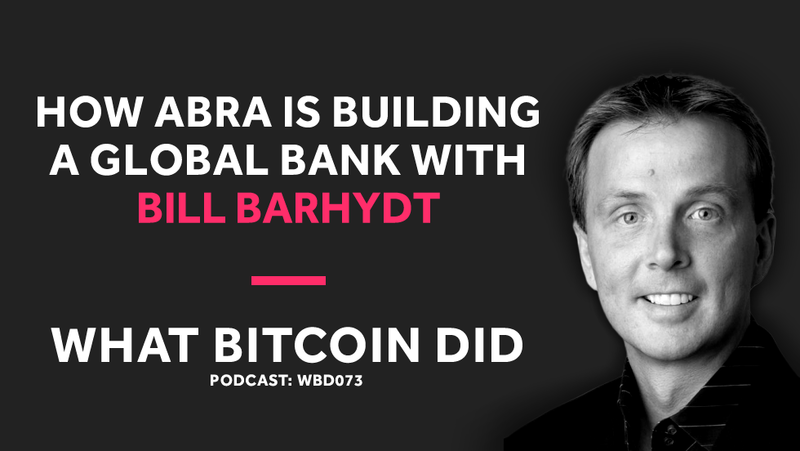 Bill Barhydt: Look, I don’t think that ABRA is going to kill US banks or western banks or large Chinese banks, okay? I don’t have any delusions about that. I think what we’re doing is we’re levelling the playing field in terms of global access, right? So people all over the world … and there are a few billion people who simply don’t have access easily to invest in the kind of assets that ABRA’s providing because the amount of money they’d be investing would be too small. You can’t buy an Apple share if you want to invest $50. It’s not possible. But with ABRA you can, right? So you can actually do micro investing or fractional share investing. And so those are two reasons why ABRA is really interesting. One, we provide access in hard-to-reach places and, two, you can do small dollar investing, right? And three, if you’re a Bitcoin believer and you want to make deposits and withdrawals into and out of ABRA using Bitcoin, you can actually do so in a way that doesn’t require ABRA to know who you are, because you’re holding that Bitcoin in your ABRA wallet. And when you make the investment, you’re actually not giving the Bitcoin to ABRA. You’re actually holding on to it, and the smart contract that you’re entering into locks that Bitcoin effectively on your phone so that neither you nor ABRA can touch it until that investment settles. And so that gives you ultimate privacy and ultimate security and control over your money. And we think that is the future of banking, not giving your Bitcoin to a centralised exchange, which effectively is no different than a traditional bank anyway. Peter McCormack: Okay. So you’re actually delivering on that crypto term “be your own bank.” You’re actually delivering on that. Bill Barhydt: Absolutely. It’s a significant tenet of our core beliefs at ABRA. Peter McCormack: So it’s almost like people will have two banking relationships. They will have their traditional kind of high street bank, probably for managing their salaries and their mortgage payments and things such as that, and then they’ll have this kind of personal bank which is their access into a kind of global, digital financial infrastructure. Bill Barhydt: Absolutely. And we think that this collateralisation of real-world assets asks as the best segue, gateway, into the digital realm in a way that doesn’t require people to overtly make a bet on Bitcoin if they don’t understand. Peter McCormack: Quite an infrastructure you must be building. Bill Barhydt: It’s astounding. We spent two years just building stuff before we were able to launch because think about it. We’ve effectively figured out how to create a synthetic version of any liquid, real-world asset, right? I don’t know of anybody else on the planet who’s been able to achieve that, and we’ve done it through sheer force of will of understanding how Bitcoin works, how complex financial engineering works in the real world, merging the two, right? So not only do we have a complex engineering infrastructure, we also have to run a trading desk to manage a counterparty risk on those smart contracts. And we effectively run a model of that that neutralises all counterparty risks to ABRA on those contracts at relatively low cost. And we have to do that because, if a consumer … if the price of Apple goes up a thousand-fold and I have to give the consumer that much more Bitcoin and I don’t have it, well, it would be unethical for me to enter into that bet with the consumer in the first place. So in order to eliminate the risk in both directions, ABRA has to hedge away that risk in real time. That would be unethical of us not to do that from the consumer’s perspective. So that’s a very sophisticated piece of the business in and of itself, independent of the technology. It just works in concert with the technology. You can’t have one without the other. So what we’ve built is totally unique and really lays the basis for the next generation of banking. Look, the average consumer has no idea what happens to their money in money market accounts. They don’t know what happens in repo markets, they don’t know how money markets work, et cetera, et cetera. But yet they still use the bank. What we’re doing is infinitely better because we’re saying you’re in control of the keys and you get to decide how you use the keys that you’re controlling. If you want to invest in stuff, ABRA will be the counterparty. And we do disclose, right, how we basically hedge our bets so that we can make you whole, but now the consumer has the control over that collateral. And I think that’s an infinitely better model longterm. Peter McCormack: How do you hedge? Are you buying or short-selling the underlying asset? Bill Barhydt: In logical terms, yes. But it’s a little bit more sophisticated than that ’cause that would be very expensive. So there’s a lot of ways, similar to your CFD markets in the UK or the ability to borrow shares the way hedge funds would do, that give us 100% coverage on the movement of the underlying assets without having all of that cost, so that we don’t have to pass that cost onto the consumer unnecessarily. And so the only challenge in the ABRA model is the catastrophic failure of Bitcoin, meaning if Bitcoin goes to zero quickly our model breaks down. And so that is … at 60 billion dollars, that is highly unlikely to happen. But our users are protected even if Bitcoin is … Like last year when Bitcoin fell 85%, our users didn’t lose a penny. More importantly, to our future to be able to support our users, we didn’t lose a penny either while we were making all of our users whole. So the system works. We’ve proven that it works to the tune of almost, I think, over 800 million so far in transaction volume that’s flowed through the system since we launched it about 14 months ago. Peter McCormack: So you could end up delivering quite a bit of volume to the Bitcoin blockchain. Bill Barhydt: Yeah. So somebody wrote an article on Forbes yesterday, and the title was more or less the ABRA app could actually significantly drive the price of Bitcoin higher. And think about, right? So if we’re collateralising every single asset on the NASDAQ and then later let’s say on the Shanghai and then later on the London Exchanges and making those available to consumers in 155 countries, right, there’s not enough Bitcoin to collateralise all of those investments. So what’s the implication of that? Well, the price has to go up if everybody’s trying to collateralise their investments at the same time. That’s really interesting. And that’s part of why ABRA is such an interesting use case for Bitcoin. Not only does it make Bitcoin easily usable for the average consumer, but it also makes it really interesting for institutional investors who stand to profit tremendously from the model. Peter McCormack: But we have a fee market within the Bitcoin blockchain. If you start delivering significant volume to it, how’s that going to impact you if the fees started going up to, say, 20, 30, 40 dollars? Is that a problem for you guy? Bill Barhydt: Yeah. It is. It is. If we don’t make any changes, it is. And so our intent is to leverage these new first and second layer technologies over time, where we’re supporting SegWit of course on the first layer and we want to support Lightning on the second layer. And if we effectively turn ABRA apps into quasi-Lightning nodes or allow them to connect with other existing Lightning nodes, that should dramatically lower the fees that we have to settle physically on-chain. There are instances where we absolutely have to settle physically on-chain, depending on new instances of what the consumer’s doing, and I won’t bore you with that. But by and large, we should be able to use those technologies correctly to dramatically lower the fees that we’re paying on average. So if fees skyrocket on-chain to let’s say $50 like you said, that should be advertised across lots of transactions because of the way we’re using layer two. Peter McCormack: Right. Okay. Have you guys look at Liquid, the side chain from Blockstream? Bill Barhydt: Yeah. Not only that, I’m going to hang out with Samson here in Mountainview today. And we are familiar with it. I love what Blockstream is doing. I think it’s really astounding. I’m big fans of them, and they really build for the right future. And of course, they’re making a huge bet on that future. But I love it, and we need that in our space. ABRA is really looking for the consumer applications of that infrastructure, and Blockstream is building very complementary infrastructure. And so I’m excited about that. And so, yeah, big fan. And another point, like I mentioned, obviously this is some huge financial infrastructure and it isn’t an SQR database. You are dealing with a ledger essentially. Are there things that kind of keep you up at night and worrying? Are there kind of potentials for catastrophic bugs which have some kind of cascading effect which is dangerous for your business? Bill Barhydt: I worry about that. I do, honestly. Look, I think that the core team for Bitcoin has made no bones about the fact that security and reliability is priority one for them, and anything related to scaling transaction volume is a distant priority too of that. And that’s, I think, comforting in terms of knowing that the likelihood of catastrophic bugs entering the system is very low. On the other hand, even in that layer two models, eventually, we’re going to need more on-chain scaling. Now, other modifications to layer one coming out over the next 24 months should address a lot of that, but eventually, it’ll also have to be addressed via block science I believe. But all of that having been said, I am extremely bullish on Bitcoin’s roadmap right now, and I have no explicit reason for concern other than it’s my job as CEO to worry. We’ve made a bet on a technology to run our business that we simply don’t control, right? And we accept that. We knew that with eyes wide open coming in. But it’s the right bet. It’s the bet that basically says no government is going to be able to stop this at scale, and it’s the great leveller in terms of financial services, the same way that BitTorrent was the great leveller in terms of being able to share data, right? And so we’ll see if we’re right on that bet. I think we’re right whether ABRA is ultimately right or not. But time will tell. Peter McCormack: Why do you think more companies aren’t building on Bitcoin in a similar way to you are? Bill Barhydt: I think it’s too hard for most companies. The Bitcoin is not a Turing complete scripting environment, right? It’s got, what, 10 opcodes. And Ether itself is Turing complete. So building complex systems in Bitcoin is very, very difficult, right? You can’t have an on-chain, multi-sig, self-settling smart contract in Bitcoin. It’s just impossible. You need an external oracle with an external data model, and the scripts can be on-chain. All of that can more or less be done on-chain in solidity in Ethereum, but I would also question the complexity of those smart contracts versus where we are now in the evolution of the cryptocurrency market. So it’s a trade-off between flexibility, security, and your requirements, right? Bitcoin is perfect for the type of investment contracts and synthetic currency that ABRA is building. It does exactly what we need, no more and no less. If you’re building very sophisticated derivative products like a DYDX or DAI and all that stuff, you probably need Ethereum to do it on-chain. But that’s not what ABRA’s doing. Peter McCormack: Are you using full smart contract functionality within Bitcoin? Because we keep hearing about all these smart contract platforms and how amazing they are, and then Bitcoin has come back and said, “Well, smart contracts have always been available on Bitcoin.” And I’ve got a smart contract show coming up. I’m yet to do my kind of full research on it. Are you using full smart contract functionality? Bill Barhydt: Yeah. Well, in the sense of we take advantage of the opcodes that Bitcoin provides to build multi-sig contracts, the answer is yes. But Bitcoin doesn’t provide for self-settlement in the way that Ethereum does, right? You basically need to proactively sign from the physical world into the digital world. And so the multi-sig contract in Solidity and Ethereum can be done inside the contract itself, whereas in Bitcoin it can’t be. So you have to basically create a multi-sig wallet effectively to encapsulate the business rules so that somebody can’t steal the assets that are put into a contract. And so it works a little bit differently in the Bitcoin world. And so the other piece of that is that you … if the contract has anything to do with the physical world, such as the price of an Apple share, you need an oracle function, which is some neutral third party, to determine the outcome of the contract. And because Bitcoin has no knowledge of the outside world, this oracle always introduces a trust element that you just can’t avoid, right? Bill Barhydt: And that’s true of any cryptocurrency application that integrates with the physical world, and I think that’s a misnomer about what smart contracts can do, can’t do, in terms of the theory and academic perspective versus the reality. You simply have to have a trusted third party inject the key information to determine the outcome of a contract. So for example, if you put a thousand dollars into Apple shares in the ABRA app, somehow that Bitcoin contract needs to know the price of Apple shares at the time of settlement, right, meaning what’s the payout. Well, the payout is dependent upon the price of Apple shares at the time you entered into the contract versus the time you exited. Well, Bitcoin has no knowledge of the outside world, so how could it possibly know the price of Apple shares? That’s accomplished via this idea of a contract oracle, and there’s no way around that in the Bitcoin world. Peter McCormack: So interestingly, when you posted this up on Twitter yesterday, the first comment that came out was, “Is this legal?” And I’m trying to remember the name of the platform. There was one that was shut down by the US, which had a similar business model. Bill Barhydt: Yeah. Broker One, I think is the name. Peter McCormack: Broker One, yeah. Peter McCormack: So what is the difference between you and them? Bill Barhydt: Broker One was effectively running a centralised CFD swap execution facility in the US, which is … or the UK, but serving US customers, which is illegal in the US. CFDs are illegal here because, for the Brits who aren’t aware, because effectively the US has federal rules against gambling and allow states to basically regulate it on a state-by-state basis. And so what ABRA’s doing is not a centrally-cleared CFD model, right? You’re basically running smart contracts where you are holding your own crypto as collateral. There is no margin trading. Everything is 100% collateralised and, again, using these multi-sig Bitcoin scripts. It also turns out that the regulators make a distinction between contracts that physically settle and contracts that do centralized kind of net settlements in cash. And there are lots of reasons for this I won’t bore you with. Some it has to do with farming regulations and things like delivering gallons of oil and whatnot. And so because these transactions on ABRA all settle physically on the Bitcoin blockchain, we can prove that for every transaction, right? It also is exempt from a lot of that kind of regulation, which deals with kind of central clearing and in the US what we call swap execution facilities, which is a subset of CFDs in Europe. So it’s a complex model and framework that the government has provided, but we’ve spent years navigating it to come up with a model that ourselves and our lawyers believe is easily provably legal. Peter McCormack: Right. Okay. You must have some very good lawyers then. Bill Barhydt: Very good lawyers, very well-paid. Unfortunately, it’s cost me a lot of money to get to this point, but I think in hindsight it’s been worth it. Peter McCormack: Well, I think if you get this right and you do create this global infrastructure for banking, I think those fees might end up looking quite small and you can end up being … doing quite well out of this. Can you tell me about who’s backing you? Bill Barhydt: Sure. So yeah, we’ve raised I think about 35 million in venture capital, venture funding, from varied sources. First Round Capital, which is a very well-known capital firm here in Silicon Valley, American Express, Arbor Ventures, which is mostly money from Fidelity, the US mutual fund company. Then we have also funding from Foxconn, the company that manufactures among other things the iPhone and several venture capital funds in both the cryptocurrency space, such as Blockchain Capital, Pantera, and others, and then some New York City-based venture capital firms as well. So it’s a really great group of investors who provide a lot of value to us. American Express has been a great partner, for example, and we’ve worked with them closely on a bunch of different areas since they funded us over two years ago. Peter McCormack: Do you envision much competition in this sector? ’Cause I saw recently Currency.com who feel like there’s a similar sell to the user but probably built in a very different way. Bill Barhydt: Yeah. I have heard of them. I haven’t looked at it, to be honest with you. I’m going to, but I haven’t gotten a chance yet. Of course, there’s going to be a lot of companies trying to do this because the problems that we solve via this model are tremendous, and it just makes sense that if ABRA is successful, just like any successful startup, those other companies will try to replicate or copy you. I think that in the case of ABRA the technology stack is so complex that we do have a couple years headstart there. We’ll see what happens over time in terms of other companies being successful, trying to copy. But I think it’s more likely that companies may take a similar approach but solving kind of tangential business problems, such as business payments to B2B lending and not necessarily go after the consumer problems that we’re trying to solve. But I think this whole idea of crypto collateralised contracts is going to explode, and I don’t think ABRA is going to have a monopoly necessarily on that model. I do think we’re going to be the first successful company to do it for consumer retail banking applications. Peter McCormack: Can you think of other businesses or other business models that this could disrupt as well? Or would you keep that a secret ’cause you’re looking at it? Bill Barhydt: No. I think trade finance is interesting. I think large business to business payments is interesting. These are things that ABRA’s unlikely to tackle, right? At least in the near term. So I think there are … I also think are certain types of derivative models that could benefit from this for people on Wall Street doing financial engineering. Those are all outside the privies of what we’re looking at and the kinds of business problems we’re trying to solve. But yeah, there are more problems that can be solved with this synthetic asset model than just consumer retail banking. Peter McCormack: But you’re obviously, Bill, quite plugged into Bitcoin, quite plugged into how you envision Bitcoin can be used in the future, and we’ve gone through this bull market of stupidity and stupid ideas and poor investments and we’ve got this bear market, which by the way, I’ve got to the point where I’m now enjoying it. I actually … I financially survived it, and then now starting to look at a company like yours and realise what a great business model. If we start to consider this as like a phase in crypto, what do you think is important for the next phase in crypto in terms of the kind of businesses that get developed, the kind of investment that happens? Where do you think we could do a better job? Bill Barhydt: We need real-world applications, ABRA, for example, scaling infrastructure, the picks and shovels businesses all to kind of work in concert so that they’re adding complementary value. ABRA doesn’t have a plan B. We’re all in on Bitcoin, right? Bill Barhydt: So we need the core roadmap to work. I actually would posit that … they probably wouldn’t agree, but I think to a large extent, beyond just waiting 25 years for Bitcoin to become a reserve asset, they need ABRA to work because … or applications like ABRA to work, because we’re actually getting the mainstream consumer who doesn’t understand public/private key cryptography into Bitcoin in a way that they can’t do otherwise. And so I think the most important thing for Bitcoin over the next couple of years and this year is to start to look at real-world applications that make this useful for the average consumer. Peter McCormack: Right. Okay. And before we finish up, ’cause I’m sure you’re very busy, and I usually do this at the start, but you’ve got quite an interesting backstory, haven’t you? Bill Barhydt: I’ve been very lucky in terms of being able to do lots of interesting things throughout my career. A lot of them have led to the technical knowledge and wherewithal that I need, both from a financial engineering perspective as well as an internet perspective, to be able to build ABRA. And so I’m really grateful that I was able to spend time working at Goldman and the work I do at Netscape in the dot com days. But yeah, it’s been a really fun and gratifying career. Peter McCormack: So what’s coming up for ABRA that’s the most important things, and what should people keep an eye out on, and when can people access and start having a play with the product, the new product? Bill Barhydt: Yeah. So they can download our app now. They can use ABRA to invest in fiat currencies and other cryptocurrencies. There are about 30 cryptocurrencies supported and 50 fiat currencies supported. They can sign up to get early access and zero fees for the stock products and commodity products. Right now, at ABRA.com, those features should be rolled out over the next few weeks in short order. And we’ll update people via email as we get closer to turning the switch on those features. Then, in the coming months, you’re going to see some new products from ABRA. You’ll see more equity products from ABRA as well. And we’re not going to stop. We’re just going to keep making the app more useful and hopefully easier to use at the same time. Peter McCormack: Where would you be building professional trading applications and desktop-based applications? Bill Barhydt: So we are launching a web interface at some point in the next several weeks to ABRA. It will work very similar to WhatsApp or WeChat, where you basically scan the barcode on the screen to link the phone, which is way more secure than just having a web interface into a database because phishing becomes impossible. And so it’s taken a while to develop ’cause it’s very hard to get behind the scenes to create a super simple user experience, but we think we’ve figured it out. So that’s something that we’re very committed to launching in the next few weeks. Peter McCormack: And do you get enough sleep? Bill Barhydt: No. But that’s okay. It is what it is. I love to sleep. I just don’t get enough. Peter McCormack: Yeah, I know. Well, listen, look, I really do appreciate you giving me this interview at short notice ’cause it was a quick turnaround. If I’m ever in the Valley, I’ll give you a shout out. Perhaps we can meet in person, and please do say hello to Samson for me. And yeah, how can people stay in touch with you and who do you want to hear from? Bill Barhydt: Sure. On Twitter, I’m Bill Barhydt, B-I-L-L, B-A-R-H-Y-D-T, my last name. And of course, they can download ABRA by just going to ABRA.com or their favourite app store. And they can stay in touch through those social media and blog channels quite easily. Peter McCormack: Brilliant. Well, listen, good luck with this. It sounds amazing. I think I’m going to have to download it again and have a proper look at it. But have a great weekend, and hopefully, I’ll speak to you soon, Bill.